I went outside to play with Rachel yesterday afternoon and glanced at my garden. The first thing that struck me was how much the onions had grown. 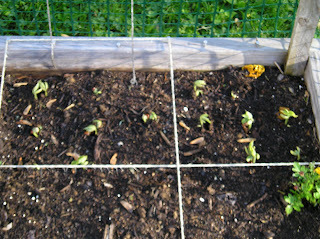 Then I glanced at the beans (they are fun because the sprouts look so big and robust), and sure enough, most of them were popping out of the ground. The cucumbers were also looking good. Upon close examination I could see that the carrots were there too. 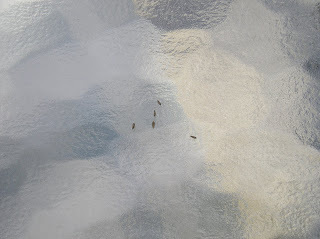 They are really tiny, so tiny that I don’t think you could spot them in a photo, but you are welcome to check them out in person. 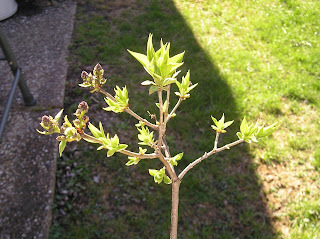 After all of the rain and wind this past week(end), my lilac stick is pretty much bare. Not really bare exactly, the leaves are still there, but all of the lilac petals are gone. I hope that your garden is (or very soon will be) rockin’! So how do you like my smileys? Rachel loves them. Here is one of her. Here she is in her sunglasses. I tried to wait, I really did, but the beautiful weather, the presence of my plants, my desire to not clean, all combined forces to push me to plant my garden a little earlier than I had planned. Derby day (the first Saturday in May) is recognized around here as the last possibility for a spring frost, so that is when it is safe to put everything in the ground. I checked the weather, and didn’t see any chance of frost, so I went ahead and gambled and put in my garden. 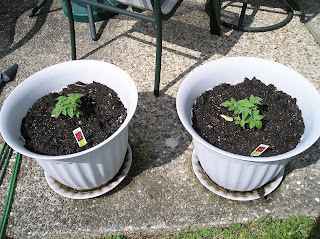 We have six tomato plants (4 regular, and 2 cherry), 1 pepper, canteloupe, cucumber, beans, carrots, lettuce, onions, and marigolds. 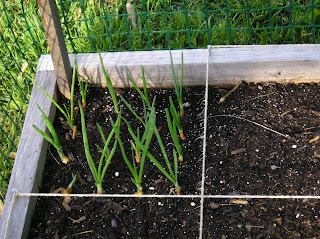 The onions and the marigolds have the job of keeping out bugs. With such beautiful weather Rachel and I decided to enjoy some time in the back yard and get some work (or whatever) done in the garden. Does taking pictures count as working in the garden? Remember nearly a month ago I took some pictures of the garden? Well, these past few weeks have seen some changes. Here is my lilac stick (or as some people call it, a bush). That’s Rachel in the background. 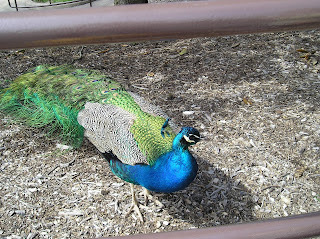 This is what will be going in my garden very soon. 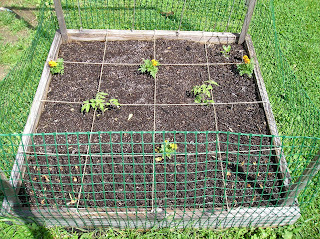 There are six tomato plants, 1 green pepper, and some marigolds. 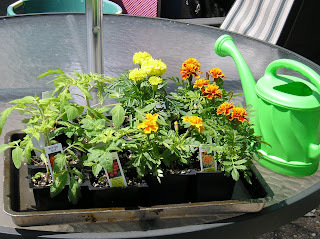 Marigolds are supposed to be good for keeping out bugs, so I plan to strategically place them around the garden. Here is my blackberry bush. I haven’t seen any blossoms yet, but it is getting some nice leaves on it. Hopefully the blossoms will show up soon. Here are my burning bushes. I love these things in the fall when they turn red. Red is my favorite color. Here is my Rachel blossoming in the back yard. She is growing like a weed, but the kind of weed we like. Several busy days have gone by . . .
We have had some full days for the past little bit. On Monday we went to Marlene’s house. Of course while we were working on our project, it was rainy, but that afternoon it was a lot nicer. 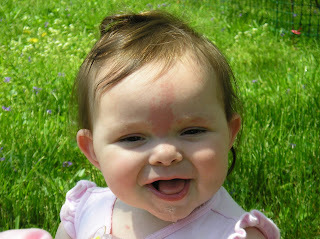 Rachel really enjoys being outside. Me too. We decided to take some “before” pictures of our back yard, then we can see the progress it makes every month. We moved into our house nearly three years ago. 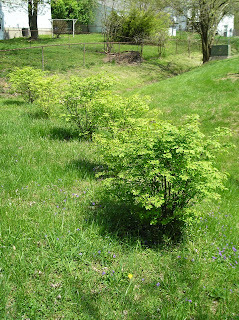 At that time Jeff’s grandfather planted for us two lilac bushes and three blackberries bushes. Only one of each has survived. 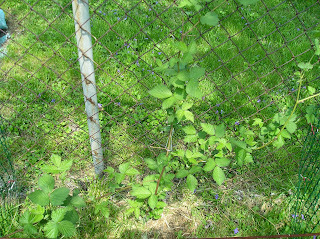 Last year we were finally going to be able to harvest approximately 17 blackberries from our bush, but something (maybe it was Scout, or maybe it was the groundhog that lives in the drainage pipe) stole the only branch that had the berries on it. So this year I hope we can manage some berries. 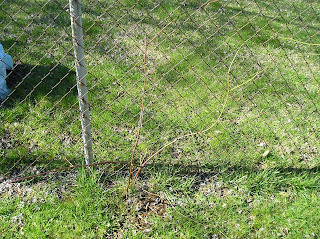 Our lilac bush at this time appears to be a lilac stick, but I can see gradual progress being made. Hopefully in several more years it will be a real bush. I am seeing some lilacs starting to bloom. 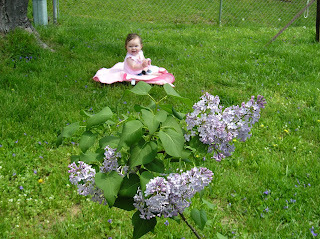 We had a few lilacs last year already. 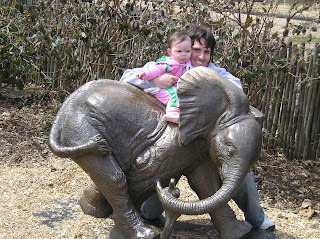 Yesterday (Wednesday) we went to the zoo (again). This time there were more of us. 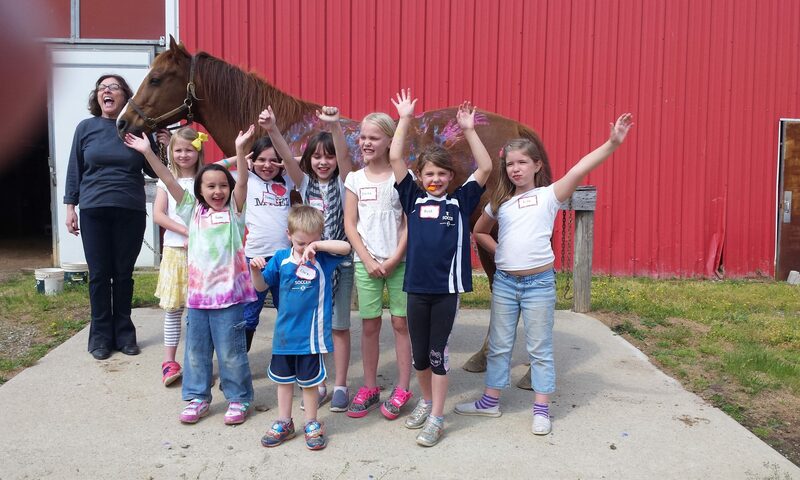 Jeff’s mom brought the other grandkids from Lexington, Andrea and Jonas, and Rachel and myself all went. As long as the sun was out and there was no wind it was quite nice outside. 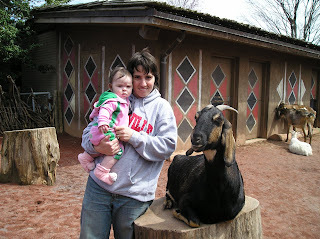 Unlike our previous zoo trip, Rachel was actually awake for most of our visit yesterday. She is growing up so fast. 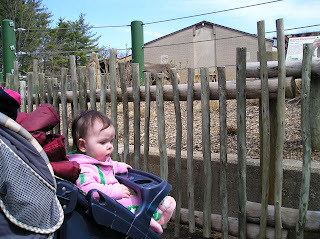 She sat up in her stroller (with a little support from the diaper bag) and looked at all of the animals. The monkeys were having a lot of fun. So I started planting my garden today. I have two 4′ x 4′ square raised garden beds. Each of them is divided into 16 squares of 1 square foot each. 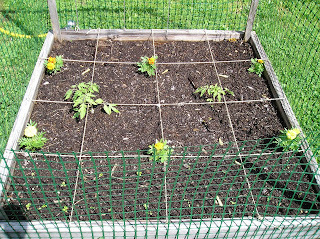 The idea is to plant a different item in each square foot. I planted two (2) square feet of lettuce. Lettuce seeds are very tiny, so they are kind of a pain to plant. Here are some. 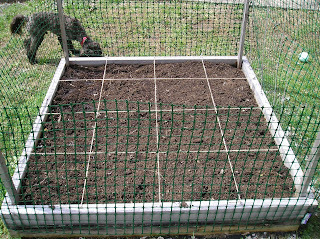 I put four plants in each square, so I put in eight plants so far. 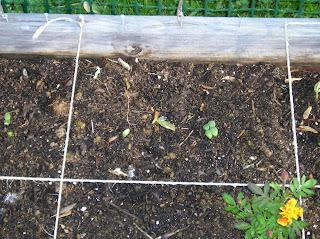 I will plant two more square feet in a couple of weeks. Lettuce is a cool weather plant, and is frost hardy. Last year I started them a little too late. I hope this year to improve my harvest a little. 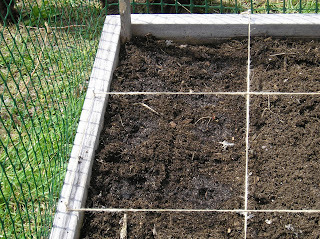 Here is a picture of my lettuce field. It doesn’t look like much right now, but check it out again in 7 – 10 days. We should have little baby lettuce plants by then.